park's 54th birthday. Officially retiring on this day, Sklar's window is above City Hall at Town Square. Animators that was shown in Disney-MGM Studios. dedication speech is shown on Jumbotrons around the park. day. This Disneyland production is not completely identical to the Fair's. A new pre-show, "The Lincoln Story," replaces the Fair's which centers around the state of Illinois. of the show in 1955.
later Art Linkletter took part in the televised grand opening of Disneyland. ceremony at Disneyland. He also hosted the 1959 television special for Disneyland’s first New Tomorrowland. A Bug's Life - is born in Missouri. She also hosted a 1972 episode of The Mouse Factory. representative in the Nordic countries of Norway, Finland, Denmark, Iceland and Sweden. Disney's film Victory Through Air Power premieres at the Globe Theatre in New York. This strong propaganda film (based on Major Alexander P. de Seversky's book of the same title) combines live action with animation. It promotes the idea that only long range airpower can win World War II. in Anaheim, California. Broadcast on ABC, it is the biggest live telecast to date! Disney's live-action feature film Savage Sam is generally released. 1930s, specializing in jazzy renditions of pop standards and novelty tunes. for Disney Consumer Products, passes away in Paris, France. as Wayne Szalinski, is released to theaters. hardened homicide detective, goes undercover to investigate the murder of a Hasidic diamond-cutter. junior accountant in 1947, he rose through the ranks to become manager of Guest Communications. He'll be named a Disney Legend in 2005. Matterhorn singing "The Mickey Mouse Club March" and a sing-along version of "Happy Birthday,"
Disneyland Ambassador Team, and an aerial photo of the Disneyland Resort and surrounding area. as part of the expanded Disneyland Resort in Anaheim. At Disneyland Paris, Planet Hollywood receives a star-studded opening at Disney Village. Guests at the opening celebration include Lion King voice artist Whoopi Goldberg. The All-New Woody's Roundup takes place on the Golden Horseshoe Stage. actor Martin Landau takes part in the ceremony by delivering Lincoln's Gettysburg Address. At Disneyland, a ceremony is held at 7:45 a.m. on Main Street, U.S.A. to celebrate the park's 48th birthday. of extremely unique photo collages for the park's 50th anniversary. People for the Peoplemover debuts on the Internet. The site represents a people-powered movement dedicated to returning the Peoplemover attraction to its rightful place in Disneyland's Tomorrowland. Disneyland celebrates its twenty-fifth anniversary with a 25 hour party starting at midnight and ending at 1 AM on the 20th. "I Was There!" birthday buttons are handed out to guests. Disney's film Greyfriars Bobby: The True Story of a Dog (based on the novel by Eleanor Atkinson) is released. Set in Scotland in 1875, it tells the story of a Skye Terrier named Bobby, who travels to Edinburgh with his master, a shepherd called Old Jock. When the man dies of "old age, exposure, and starvation", and is buried in the Greyfriars Kirk, the dog refuses to leave his master's grave. Fifty-three years ago today Walt Disney’s Magic Kingdom of Disneyland first opened. presentation (which first debuted in 1957). for both Outstanding Original Main Title Theme Music and Outstanding Original Music And Lyrics. day with friends and family at Disney World. A patent for a "panoramic motion picture presentation arrangement" is filed with the United States Patent Office by Walt Disney and Ub Iwerks. The patent application is specifically for a method of filming a 360 degree panoramic film using eleven 16mm Kodak Cine-Special cameras (and projecting them in 16mm). The patent will be granted June 28, 1960.
it's just been sort of a dress rehearsal and we're just getting started. Disneyland celebrates its 15th birthday along with 130 of the park's original Cast Members - who will now be known as Club 55.
characteristics in a mouse, and who has been free, ever since, to produce his very special type of fantasies." and I appreciated the experience enormously. I thought of him as a genius." Jamboree. He will retired from the Disney Company in 1979 and be named a Disney Legend in 1996. At noon, Disneyland employees hold a dedication ceremony in Town Square near the entrance of Disneyland celebrating the park's 55th anniversary. Later in the afternoon, employees lead a park-wide sing-a-long of "Happy Birthday." The Disney All-American College band celebrates its own anniversary, the 40th, with nearly 300 current and former performers from both Disneyland Resort and Walt Disney World Resort performing twice. In the evening, Disneyland’s Alumni Club meet at the Disneyland Hotel to celebrate the park's 55th birthday. 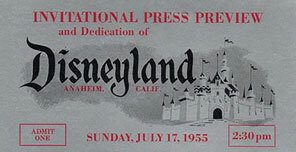 A celebratory moment is held at 2:30 p.m. to commemorate the 56th anniversary of Disneyland's opening day. An audio recording of Walt Disney’s original dedication speech is broadcast throughout Disneyland Park. Mickey Mouse, Minnie Mouse and a cast of characters gather in Town Square to sing "Happy Birthday" to Disneyland with guests and cast members. of the Anaheim park thirty years ago. To You" with Disneyland park guests on the park's 57th anniversary. theme park's birthday, followed by a dance with characters to Cinderella's "A Dream Is A Wish Your Heart Makes." the former CEO of The Walt Disney Co., and Walt Disney's son-in-law. Motion Pictures, it stars Paul Rudd, Michael Douglas, and Evangeline Lilly. Armed with a super-suit with the astonishing ability to shrink in scale but increase in strength, cat burglar Scott Lang (Rudd) must embrace his inner hero and help his mentor, Dr. Hank Pym (Douglas), plan and pull off a heist that will save the world.